CHENNAI: Asignage outside the Madras Literary Society reads ‘The Library of Babel’. The historic venue is one of the places exhibiting unique collections of photographs as part of the Chennai Photo Biennale (CPB). We were at MLS for a guided tour of the venue, by Pushpamala N. The theme of the exhibition revolved around the works of three artists — Putu Sayoga, Angela Grauerholz and Liz Fernando. “The motto of CPB was to put heritage and forgotten public spaces in limelight. While the team was scouting for places they ended up at MLS. Moved by the charm of this building and its Indo Saracenic architecture, they decided to use this as a location. The works have been displayed without causing any changes to the ambiance,” said Prabhu Viswanathan, a volunteer member of the library. The entrance of the age-old library was dotted with photographs by Putu Sayoga, a Bali-based documentary and travel photographer. 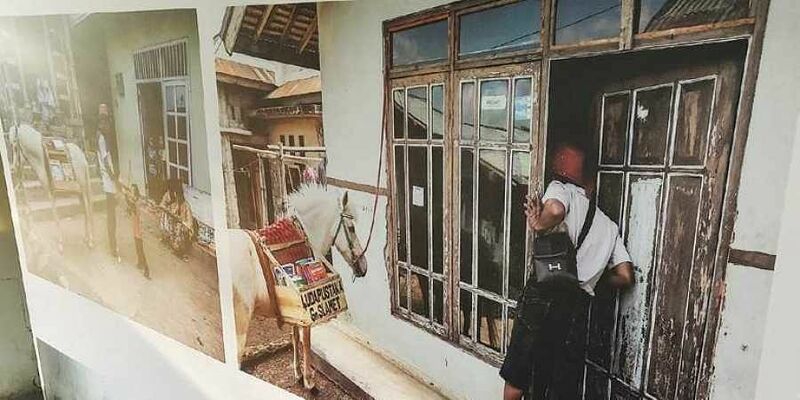 He has used visual imagery as a story-telling medium to explore the story of a horse-caretaker named Ridwan Sururi who uses his horse as a mobile library for kids in a remote village in Central Java in Indonesia. His motive was to highlight the importance of books for the future of the kids. We moved into a relatively empty space in a corner of the library hall. Two heavy-bound books in red and blue were placed on two separate wooden tables. These were the works of Canadian photographer Angela Grauerholz. The pages had to be flipped only using gloves. It was after she lost her library to a fire accident that Angela began to focus on the book as an object and space for mapping out ideas about the ways in which we decipher the inner and outer worlds. The red book was titled Privation project and it was completed in 2001. She had scanned the front and back cover of a selected number of books that were burnt in the fire, leaving the content hidden from view or at times only a word or title partly visible. Her blue book titled The Empty Shelf is an ongoing project. Angela works with archives along with libraries and collections that have helped her understand and consider the consequences of the transformation of data into a virtual matrix of knowledge. “CPB chose the themes in a way that they connect with space where the works are displayed. We have displayed the works in different places that follow the path of a natural maze within the library,” said Prabhu. The last work was that of a German photographer Liz Fernando. She has been researching the work of French philanthropist Albert Kahn’s Archive of the Planet. She has used glass as a medium, with a special technique, to display the works.,The exhibition will conclude on March 24 at Madras Literary Society.